Last week I posted about the tree atop Siwash Rock, one of Vancouver’s most recognizable natural landmarks. What was missing in that story is that Siwash Rock had a wife or two that were also turned into rocks by a transformer. I’d long thought those other rocks had been destroyed or moved and forgotten, but found the one called Sunz Rock last week on a trip around the seawall. She’s eroded somewhat since the 1930s and vandals long ago chopped down her tree, but she sits in the same place she always has, just below the Lions Gate Bridge at Prospect Point, snuggled against the seawall. Sunz Rock seems to have been completely forgotten. A google search only turns up three pre-WWII photos in the City of Vancouver Archives and a reference in The Man Who Saved Vancouver, Daphne Sleigh’s biography of Major Matthews, Vancouver’s first archivist and one-man heritage movement until his death in 1970. Sleigh mentions that a map Matthews made based on oral histories he collected led the engineers working on Lions Gate Bridge to change their plans so as not to damage Sunz Rock. It’s likely that Matthews intervened again to ensure Sunz did not become a casualty of seawall construction in the early 1960s. The only post-WWII reference I found to Siwash Rock’s wife was a postscript someone added to Pauline Johnson’s version of the Siwash Rock legend, claiming that “the rocks which were his wife and child were blasted to bits [during construction of the seawall], and lie somewhere underneath the wide band of concrete which now circles the peninsula.” This is probably true for Skaalch’s other wife and child, two rocks that stood about eighty feet from Siwash Rock, but not for Sunz Rock. 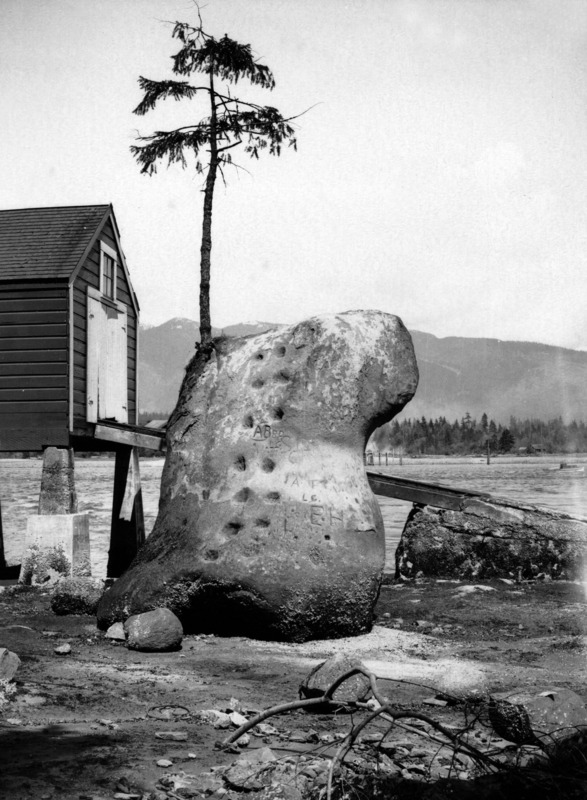 Source: Photo by Stan Williams, 1937, City of Vancouver Archives #St Pk P91; then-and-now archival photo, Siwash Rock ca. 1930, City of Vancouver Archives #CVA 1376-461; colour photo taken by me, 17 October 2013.